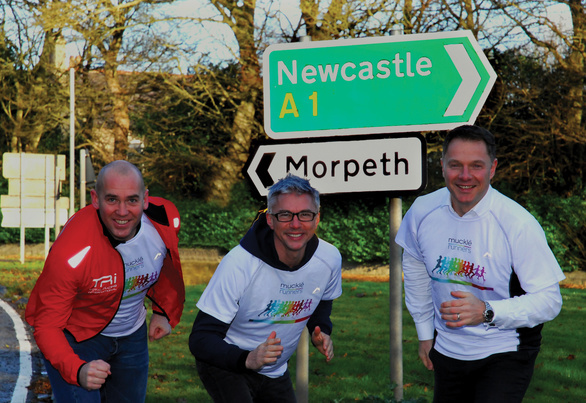 Home > News > Morpeth to Newcastle Marathon…Not just a Hop, Step and Jump! Morpeth to Newcastle Marathon…Not just a Hop, Step and Jump! We are delighted that world record holder and Olympic gold medalist Jonathan Edwards CBE has teamed up with race organisers to officially launch the new date for the oldest road-race in England. The marathon, which was successfully re-launched last year by Newcastle based Total Racing International, takes in 26 miles of stunning Northumberland and North Tyneside coastlines before finishing on the quayside and will take place again this year on Sunday 29th October 2017. Entry’s for the race are now open to members of the public. Organisers are predicting an even bigger turn out for this years event which will again include a 1/2 Marathon from Whitley Bay, a 26 mile Cycle Sportive and a mini-mile fun run along the quayside for children aged between 3 and 17 years of age. Phil Gray, Managing Director of Total Racing International said, “We are delighted to announce the new date and that entry’s are now open to members of the public for this years events. “We had some amazing feedback from last years participants and third parties and we have been working with Northumberland, North Tyneside and Newcastle Council’s to ensure the race can again take place this year. Jonathan Edwards, 2000 Olympic Champion and keen cyclist, said , “I am delighted to officially launch this years race. The Morpeth to Newcastle Marathon is still held in high regard by the running population of the UK and it speaks volume’s that over 2,000 people took part in last years event. “The race regularly attracted Olympians, World record holders and running legend, so I am hoping to see some very good club runners, athletes and keen fitness enthusiasts take part in the Marathon and 1/2 marathon. Stephen McNicol, Partner at Muckle LLP, the first sponsor to come on board for this years events, said, “We are again delighted to add our support to this historic race and celebrations. The race is steeped in tradition and historically recognised through the UK . The 26 mile road race starts in Morpeth and follows a specially selected route passing through Cramlington, Blyth, Whitley Bay, Cullercoats, North Shields finishing on the Quayside in Newcastle. Entry details or visit www.morpeth2newcastle.com for more information.